The offices of the newspaper Charlie Hebdo came under gunfire earlier today by three masked men who killed 12 and left two critically injured in the worst attack on France since 1995’s Paris train bombing. The gunman, who wielded assault rifles and a rocket launcher and yelled “Allahu Akbar” (Allah is the greatest) as they stormed the building, have been identified and the youngest attacker, 18-year-old Hamyd Mourad, has turned himself in. Authorities are working hard to locate the other two men. 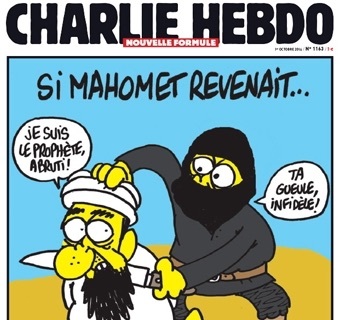 This is the second time the employees of Charlie Hebdo have been endangered over their content. In late 2011, the headquarters were bombed over cartoons of Mohammad and other Islamic icons in compromising positions. For us to see the kind of cowardly, evil attacks that took place today, I think, reinforces once again why it’s so important for us to stand in solidarity with them, just as they stand in solidarity with us. The fact that this was an attack on journalists, attack on our free press, also underscores the degree to which these terrorists fear freedom – of speech and freedom of the press. Hundreds rallied in Manhattan’s Union Square, chanting “Je suis Charlie” (“I am Charlie”) and singing the French national anthem to show support.